There’s a good reason why conflict and collaboration go hand in hand. Always agreeing might be your default when you lack confidence in your idea and want to save face, however, it functions more as a one-way street to boring town. There’s a good reason why conflict and collaboration go hand in hand. Always agreeing might be your default when you lack confidence in your idea and want to save face, however, it functions more as a one-way street to boring town. How can innovative ideas find their feet when there’s only room for same-same? For proactive teams with business wins on the brain, leveraging the power of effective collaboration is essential to making the most of every day and every meeting. Embracing conflict in positive ways is a crucial part of effective collaboration, since the successful collision of ideas and perspectives is where something different and exciting can emerge. Embracing conflict in constructive ways and knowing how to handle a disagreement with a co-worker will pave the way for a culture in which effective collaboration and brilliant ideas can flourish. Here are some actionable ways to embrace constructive conflict for effective collaboration. Humans have wandered the earth for a while—thankfully we figured out that after we put down all our pointy sticks and worked together, things were great! Whether we’re trading food and resources or sharing a patch of green, the genius of collaboration functions through working towards the same (or complementary) goals. Often the key to embracing conflict in positive ways begins long before you’ve even opened your mouths. Effective meetings start and end with stating and then reiterating the broader objectives that bring everyone to the table. With a shared understanding of the goal and what’s at stake, the focus of conflict exploration and resolution shifts. It’s less about the preferences of individuals and more about the collective goal—and what’s best fit to pursue it. Begin with a straightforward statement that poses the key question you’re trying to answer, in context of how it serves the business’ long-term goals. Conclude each meeting with a summary of the collective answer. Though the answer might not be definitive, more “work in progress,” it can and should give clarity on what are the next best steps. 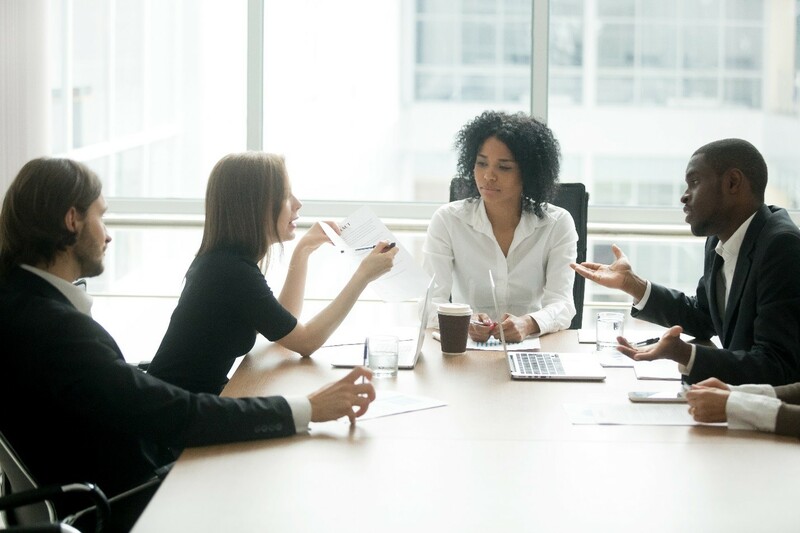 In sales, as in many industries and environments, there’s a misconception that the success of business negotiations depends on the ability of individuals to smooth talk and pitch fast. In reality, the opposite may well be the case. That’s a great point, because it addresses (GOAL A) in these ways. However, have we considered (POINT B)? What would happen if we combined (POINT A) and (POINT B)? It may help address (GOAL A) in these ways. When there’s a clear purpose in place, and a healthy respect for individual contributions, a conflict of ideas within a meeting can produce new and even better ideas. You know what they say about assuming… With too many assumptions operating, often unnoticed, it’s harder to break through perceptions of what is, to discover what could be. In many ways, innovation boils down to breaking assumptions and diving into unknown territory. One of the best ways to prevent assumptions getting in the way of effective collaboration and the flourishing of new ideas is through giving ideas the time they need to grow. Encourage a culture where people bring their best ideas to the table—nothing half baked or based on pure gut instinct and assumptions. Provide the time for team members to ponder discussion points, research opportunities and connect the dots for themselves. This means what everyone brings to the table is less about assumption and more about facts—allowing for more constructive conflict. This is where the humble agenda comes into play. A handy agenda arrives in advance and outlines the key purpose and discussion points of any meeting. When it’s time to roundtable, everyone knows what they can contribute and are equipped with know-how and insights to share. Truth is, everyday conflict is unavoidable, however chaos and drama are not. Through proactive measures to encourage thoughtful research and respectful discussion, you can embrace conflict in every meeting—to help ideas flourish in the best collaborative spaces. After all, some of the best innovation has occurred simply through teams approaching a perceived need or problem with a shared goal to answer it. Bernadette Mung is a marketing coordinator at digital marketing agency, You & Co, hustling with a proactive team of marketing minds to create effective and human content marketing campaigns for Australian businesses. Most days you’ll find her sipping a mocha, exchanging puns and cooking up a storm in the kitchen. Tweet her at @bernadettemung.